Meet Rocky, our 2010 Winnebago Adventurer. After MUCH research, Chad decided this model would work great for us and we went up to Iowa in March to get it. 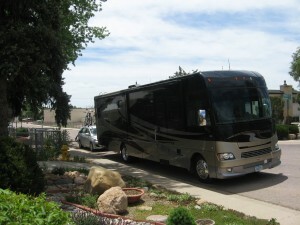 (We sold our Sundance 5th wheel and Dodge truck back in the fall, thinking we’d had enough of the transient lifestyle…! We also knew a motorhome would work better for us—easier to travel long distances while homeschooling, and this model is better equipped for fulltime living). Our tow car is a Mazda 5, which surprisingly has no name yet! Suggestions? It follows along, carrying all of our bikes, and getting us around town when the motorhome is parked at a campground.